Fr. Eduardo Scarel, O.Carm, visited Salpointe Catholic in February and discussed his ongoing efforts with Laudato Si with students, faculty and staff. This was his second visit to Salpointe, with the other coming in 2017. 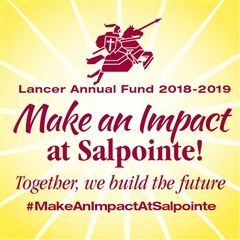 “I appreciate what Salpointe has been doing on Laudato Si because I know the school has taken on its message in daily life. That is wonderful. You see it in the sensitiveness that the students have for these issues," Fr. Eduardo said. Fr. Eduardo presented the scientific aspects of climate change during his visit. He also discussed the spiritual roots of the ecological crisis, the ecological and personal healing path, and proceeded in proposing some of the practical steps by which we can protect our planet. As educators, Fr. Eduardo challenged the Salpointe staff to embrace the role we all have of caring for the future of the planet. Despite it being a brief visit to the Salpointe campus, Fr. Eduardo was impressed as he said his goodbyes.